We are home again …. …. after a lovely week in south Devon. Briar loved her meadow, and she was happy that her humans didn’t ever leave her to go to work or to do errands or to do other things that humans have to do without dogs. The humans loved the peace and quiet, and the dark nights undisturbed by street lights and the like. We all loved our cottage and some lovely countryside and riverside walks. And we all enjoyed our daytrip to Totnes, a town we know and love. We had a lovely walk, a picnic in the park, and a wonderful trip around the town’s charity and second-hand bookshops. So let’s talk about books! I read a library copy of The Virago Book of Love and Loss years ago, I know I have many of the short stories it contains in other collections, but it is such a lovely selection of stories and authors that I had to pick up this copy. I haven’t read Walter de la Mere since I was a child, but a lovely cover caught my eye and the story told in The Return – the story of a man who falls asleep on a grave and wakes with the spirit and face of another an – looked very promising. Desdemona – if only you had spoken! is another Virago publication. It presents monologues that gives voices to famous women – real and fictional – ancient and modern – who never had their day. It might just be fabulous …. Old Goriot was a very timely find – it’s my Classics Club Spin Book, I didn’t have the book. and the copy I ordered from the library didn’t arrive in time for me to take it on holiday. Dear Departed: a Memoir by Marguerite Yourcenar was a Virago Modern Classic that was missing from my collection, so I was delighted to spot a copy. I already had a copy of Katherine by Anya Seton, but I knew that it was old and tatty and that the print was very small, so I picked up a lovely, recent edition that was priced at just one pound. A copy of The Enchanted Wanderer by Nikolai Leskov was my most interesting find. There’s a shiny new copy in the library, but I don’t like the translation and I don’t like that it’s overblown, padded out with extra stories. I can’t tell you the age of the copy I found, but I can tell you that it was beautifully produced by The Foreign Languages Publishing House in Moscow. 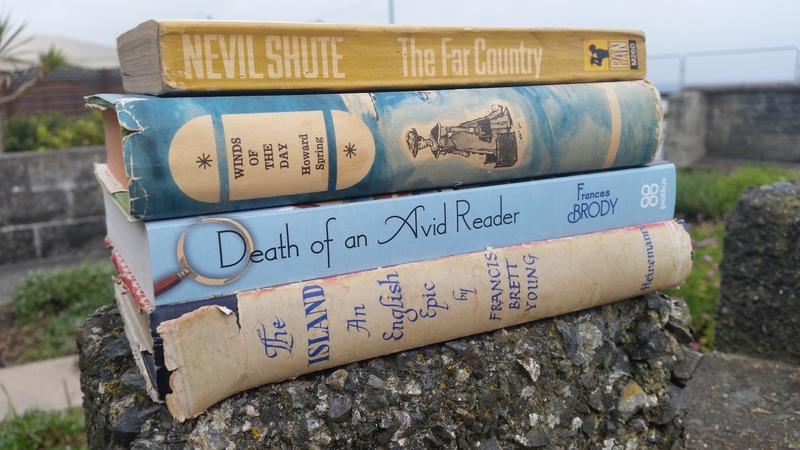 These books alone would have sent me home happy, but more lovely finds in the town’s two second-hand bookshops turned last Wednesday into my best day for books for years – maybe the best day ever! I love Kate O’Brien and so I was thrilled to find a copy of Pray for the Wanderer, a novel that I had never come across before and knew nothing about.. The Ikon of the Wall is a collection of short stories by Elizabeth Goudge. It was lovely to find one of her lesser known works in a Devon bookshop not too many miles from the home she loved, and the timing was wonderful, given that yesterday was the anniversary of her birth, and that Elizabeth Goudge Reading Week is in progress. Eden Phillpotts was another author who loved Devon, and The Farm of the Dagger is set on a part of Dartmoor that I know and love, so it had to come home. Hearts Undefeated is a Virago anthology, collecting women’s writing about all aspects of the second world war. 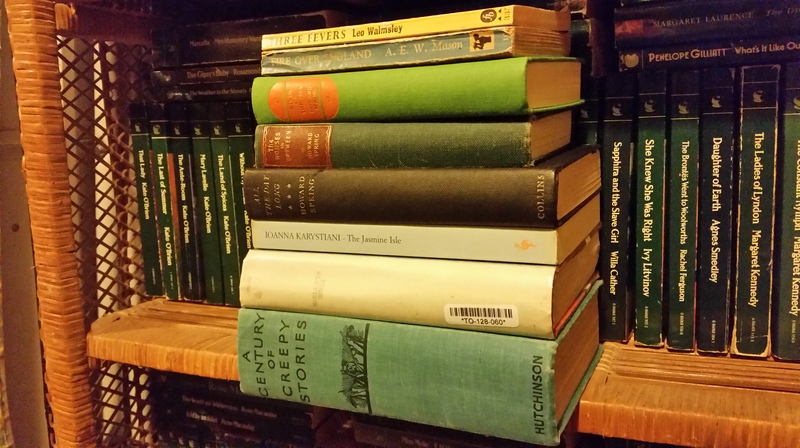 The range of subjects and authors is wonderful; there are famous names, there are Virago authors, there are Persephone authors, and there are more besides. 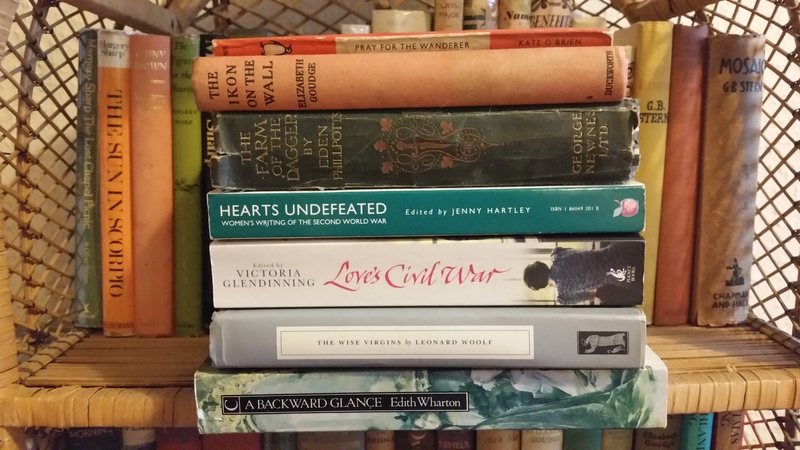 Love’s Civil War: Elizabeth Bowen and Charles Ritchie: Letters and Diaries 1941-1973 charts a love affair, and I was so pleased to find a book from my wishlist in lovely condition. 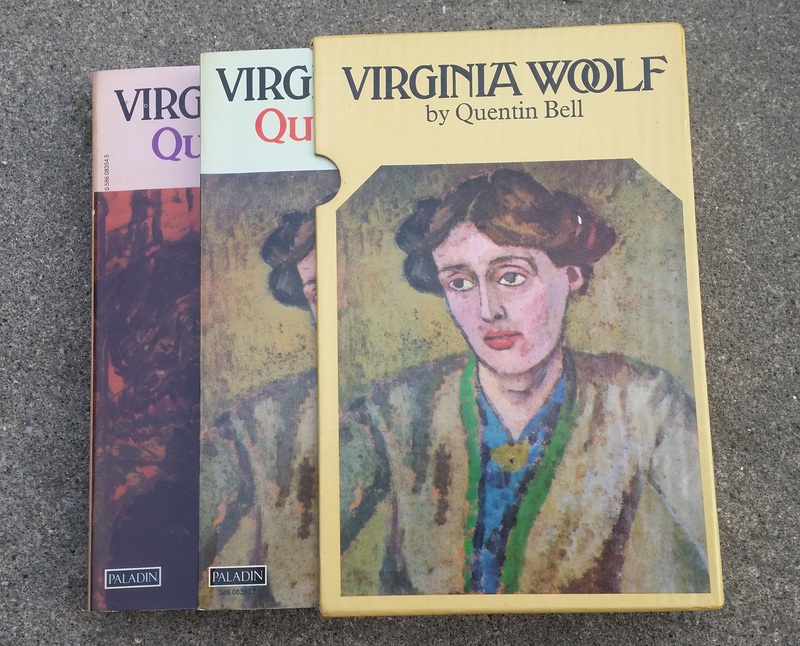 I pounced on The Wise Virgins by Leonard Woolf – I’d wanted a copy for my Persephone collection for a very long time. A Backward Glance by Edith Wharton – her autobiography – was a book I’d never thought to look for, because my focus has always been on her fiction, but I was delighted to find a copy. After such good fortune I passed by the shops selling new books – nothing could live up to the gems I’d already found. What I have to do now that we’re home again is find somewhere to put all of these books, and slow down a little. Because there are more lovely books in the world than I can read in a single lifetime. 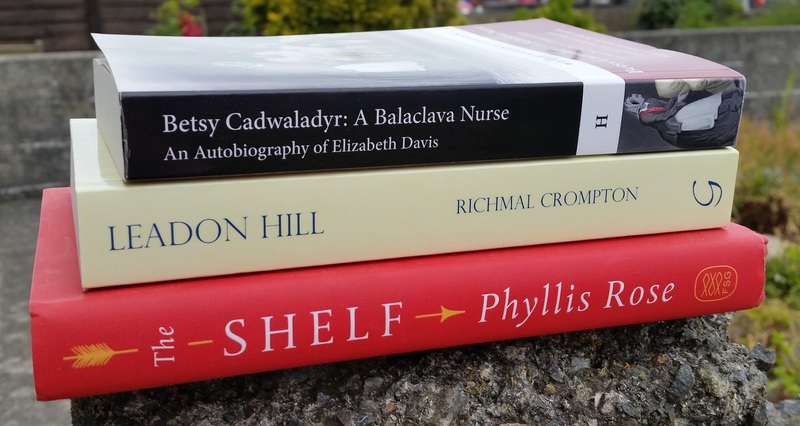 That’s the sum of this month’s book shopping – it was an exceptionally good month. This may be a long post, but I resolved to record all of my purchases this year. These were ‘library building’ purchases. I have a dozen or so authors whose books I am gradually collecting as and when affordable copies appear. 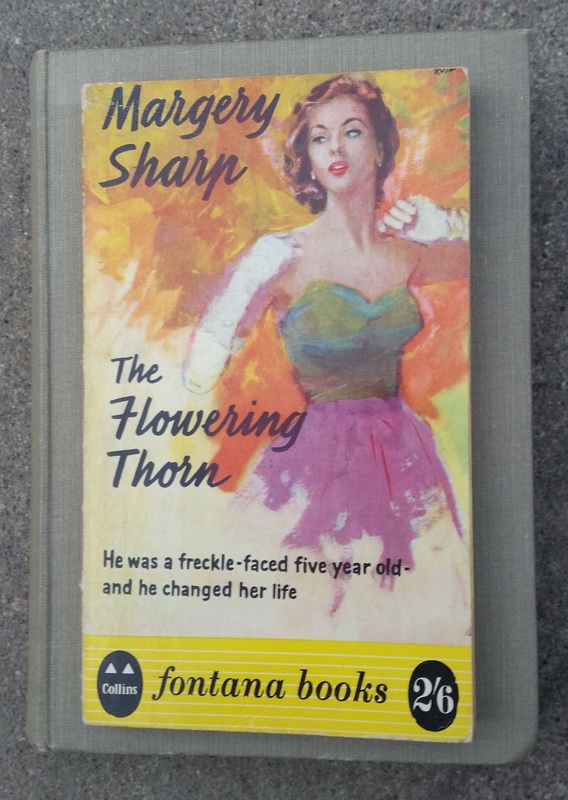 I knew that I wouldn’t be able to give back the library’s copy of The Flowering Thorn back until I had a copy to keep – that’s always the way with Margery Sharp – and I spotted a Fontana edition that was if not cheap then at least much less expensive than many. I do like Fontana paperbacks, but I have to say that in this instance the image and the tagline suggest that the artist and the writer haven’t read the books. And the rather nondescript book that one is resting on is an first edition of ‘Return I Dare Not’ by Margaret Kennedy! 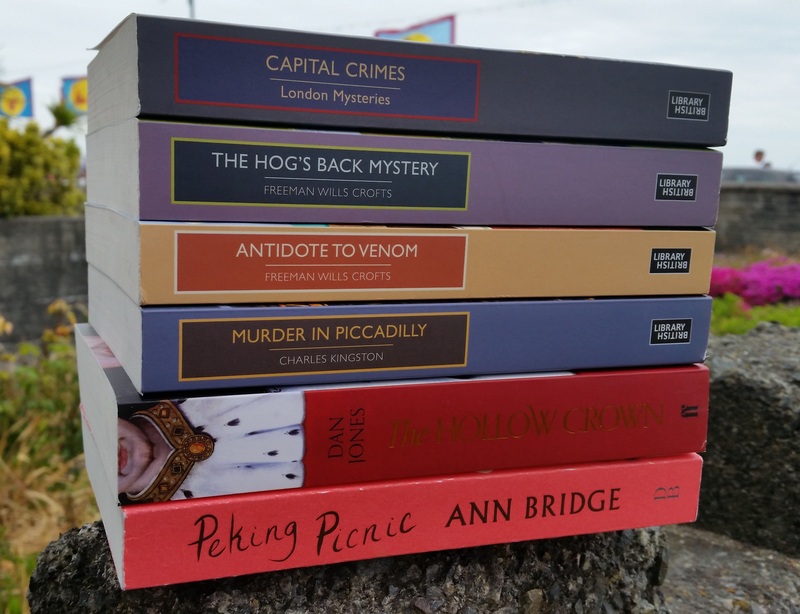 The next round of shopping was not at my expense – because I won £50 of books from Harper Collins! At first I was overwhelmed by the choice, but when I saw Vintage on the list of imprints my path became clear. ‘A Long Time Ago’ filled another gap in my Margaret Kennedy collection. Several people recommended ‘The Black Count’ by Tom Reiss after I fell in love with The Count of Monte Cristo’ so I took their advice. And of course I was going to have a copy of Victoria Glendinning’s much lauded biography of Anthony Trollope! I’d say that was £50 very well invested. Visits to two charity shops I hadn’t been into for a long time paid dividends. 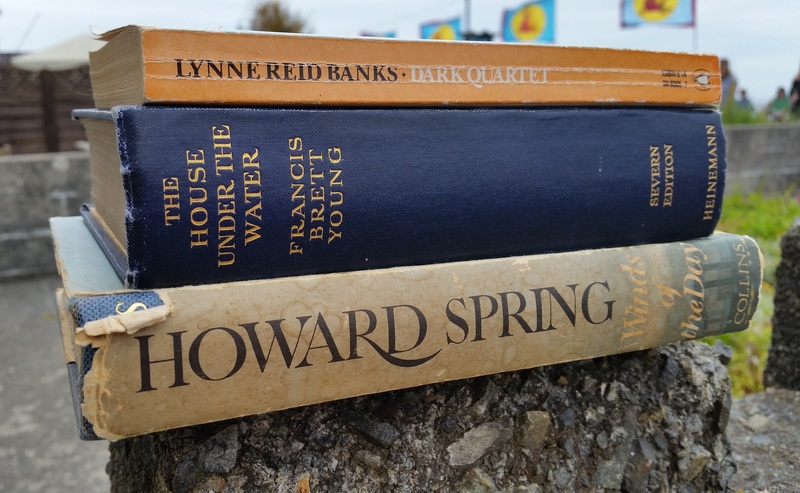 I remember my parents reading Nevil Shute and Howard Spring, I loved the books from their shelves that I read years ago, and so I was delighted to find two titles I didn’t know in lovely editions. I saw ‘Death of an Avid Reader’ by Frances Brody in the library and though I liked the look of it I didn’t pick it up because I knew that I had copies of earlier books in the same series at home unread. But when I spotted a like new copy I had to bring it home. I was always going to pounce on a book by Francis Brett Young that I didn’t have on my shelves. I love his writing. I hesitated over this one because it’s a history of England in verse, but in the end I decided that I didn’t pick this one up I might never see another copy and I might live to regret it. When I came home I remembered that I loved the extract I knew, and I knew that I had made the right decision. I picked up two more books when I dropped off several bags of books to another charity shop. A lovely hardback edition of the collected stories of Jane Gardam that was only published last year for £2 was a wonderful bargain. 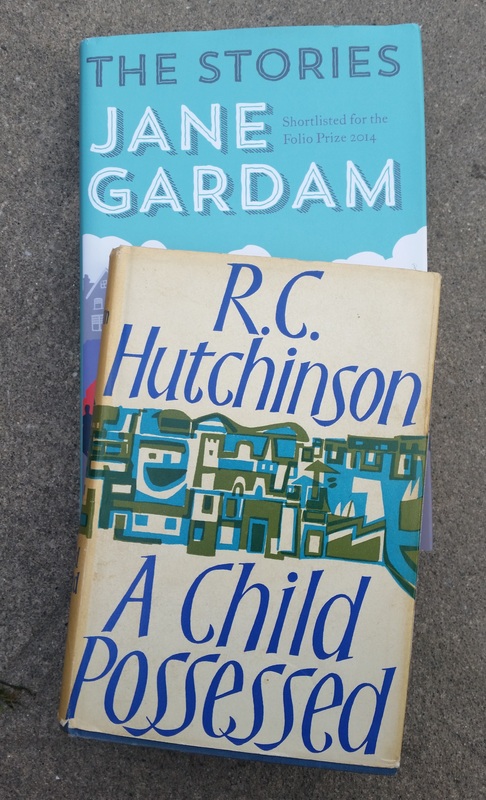 I don’t know much about R C Hutchison – and the dust jacket of this book doesn’t give much away – but I picked the book up because it was in condition and it clearly dated from one of my favourite eras. I found some 1950s leaflets from the reprints of society, that somebody must have used as bookmarks inside, adverting authors including Winifred Holtby, Somerset Maugham, Howard Spring and Margery Sharp. I too that as a sign that I should buy the book. When I got home and looked up Hutchinson I found that he had been reissued by Faber Finds and by Bloomsbury Reader, which has to be a good sign. And then there was the Oxfam Shop. Two British Library Crime Classics I I hadn’t meant to start collecting but now I have four and I think maybe I am. I looked in again next time I was passing, just in case there were any more. There weren’t, but I found this. I know the library have copies, but it was such a nice set. Just one more – a brand new hardback that I just had to run out and buy – another ‘library building’ purchase. “The winter of 1924: Edith Olivier, alone for the first time at the age of fifty-one, thought her life had come to an end. For Rex Whistler, a nineteen-year-old art student, life was just beginning. Together, they embarked on an intimate and unlikely friendship that would transform their lives. Gradually Edith’s world opened up and she became a writer. Her home, the Daye House, in a wooded corner of the Wilton estate, became a sanctuary for Whistler and the other brilliant and beautiful younger men of her circle: among them Siegfried Sassoon, Stephen Tennant, William Walton, John Betjeman, the Sitwells and Cecil Beaton – for whom she was ‘all the muses’. I’ve stayed out of bookshops today, so that is definitely it for March. 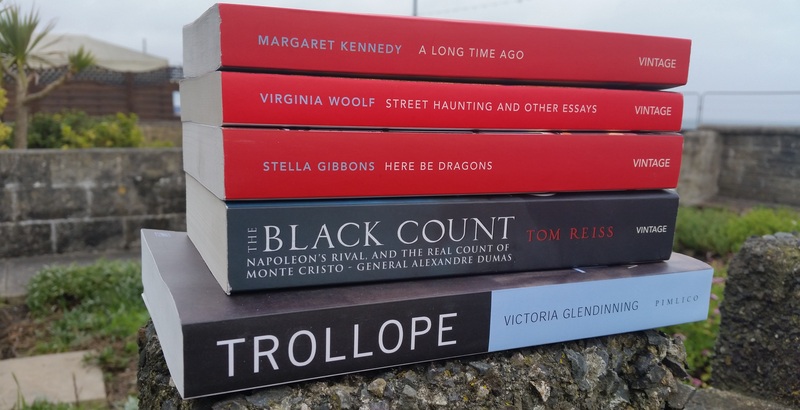 It’s been a bit mad – some lovely review copies have landed too – but there won’t be many months like that. Though we’ll be visiting one or two bookshops when we have a week’s holiday in Devon next month …..
I’m quite sure that you’ll have heard about it already, but I must mention the fabulous new autumn edition of Shiny New Books. Simon has written about one of my favourite books, that has just been reissued, and about one of my favourite authors. You will find me revisiting two of my favourite books, both now available in paperback, in Annabel’s Fiction pages. You’ll also find me writing about The Good Companion by Una L Silberrad. 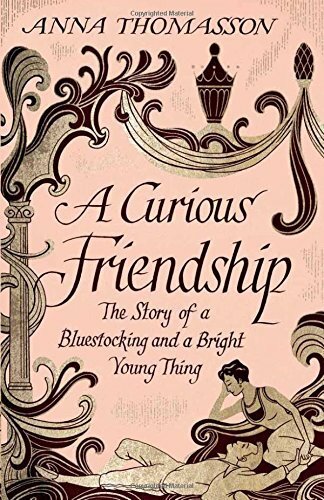 It’s a wonderful book, I’ll be looking out for more of the author’s work, and I found a heroine – from an earlier era – who I’d love to introduce to Lucy Carmichael. Yes – that good! Our annual day trip to Truro resulted in a very fine haul of books from its two used bookshops and its charity shops. I loved ‘The Lonely’ when I read a library copy, so I was very pleased to find a copy to keep. I’m not too sure about ‘Ludmilla’ – described as ‘a charming pastoral legend set in old Lichtenstein’ but as it’s by Paul Gallico I’ll give it the benefit of the doubt. ‘The Use of Riches’ by J I M Stewart (who also wrote under the name Michael Innes) is a story of art and intrigue, and so I had to pick it up. I read ‘Bright Day’ by J B Priestley years ago, I loved it, and it has a Cornish setting, so that one had to come home to be re-read. 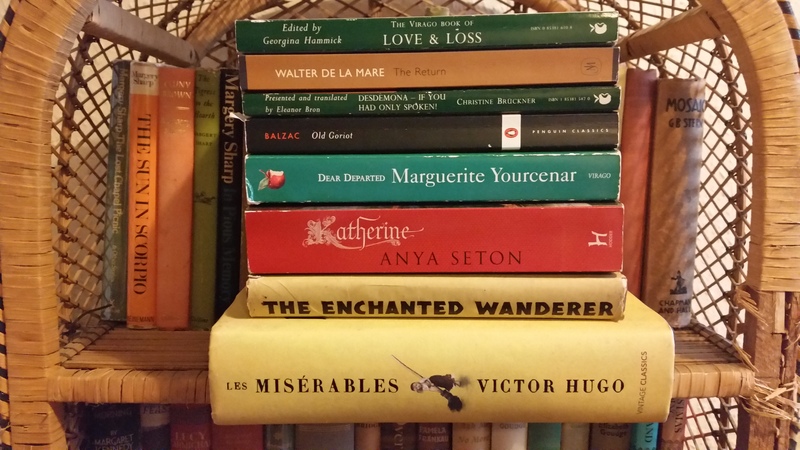 I saw a pile of books by Mazo de la Roche, and her name rang a bell but no more than that. I brought home ‘The Building of Jalna’, which on the first book (chronologically) in a long series. I liked the look of them all, but I thought it would be tempting fate to bring home more. ‘The End of Childhood’ by Henry Handel Richardson is the sequel to ‘The Fortunes of Richard Mahoney’, which Cat loved and I know my library has. ‘The Old Ladies’ by Hugh Walpole was a book I had to rescue from a 50p table. 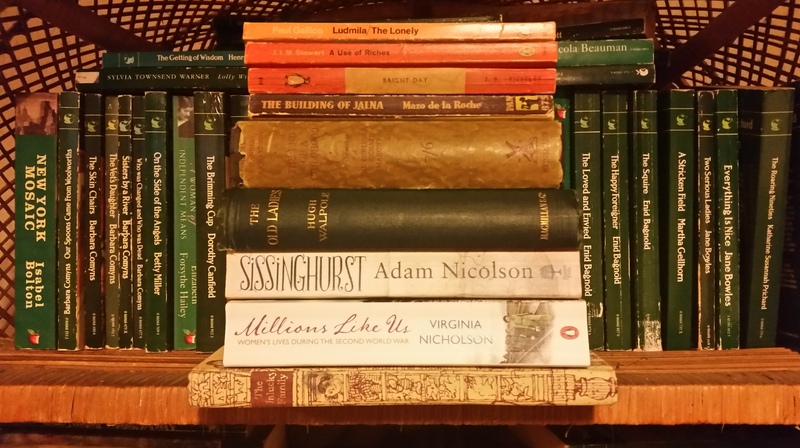 I know that the library has ‘Sissinghurst’ by Adam Nicholson and ‘Millions Like Us’ by Virginia Nicholson, but I also knew that I wanted copies of my own to keep and read at leisure, at the right time. I know nothing about Mrs Henry de La Pasture, except that she was E M Delafield’s mother and that the Folio Society saw fit to reissue ‘The Unhappy Family’, and that was enough reason to bring the book home. ‘The Provincial Lady Goes Further’ by E M Delafield – the perfect way to change gear Margaret Kennedy Week. ‘The Adventurous Lady ‘ by J C Snaith – the report will be mixed. ‘Privileged Children’ by Frances Vernon – I was very impressed by I have to track down her other books now. I’ll elaborate, I’ll get back to writing, very soon …. 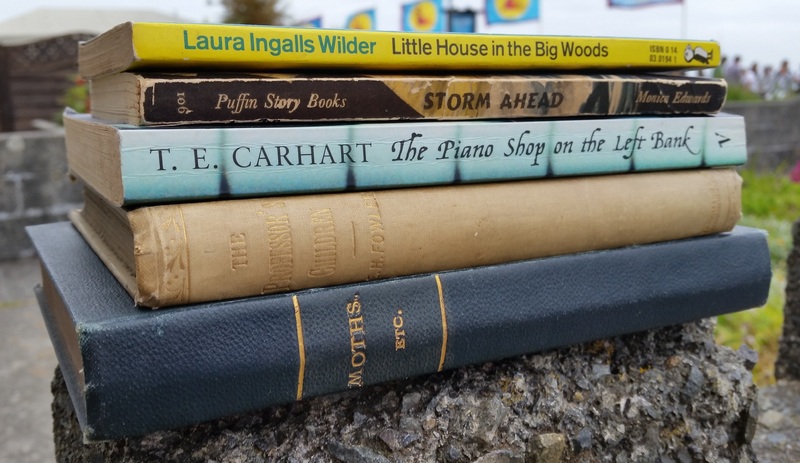 When you buy used books – if you buy used books – do you shop by imprint? Earlier today, as I rifled through a ‘3 for £1’ table in a local charity shop, I was very aware that I did. I brought home one or two books simply on the strength of the name and the logo on the spine. The Assassin’s Cloak isn’t for me, it’s for the man of the house, who doesn’t read fiction, who loves volumes of letters and diaries. I once hesitated over a rather overpriced hardback copy in another charity shop, lost it and regretted it, so when I saw this copy I pounced. I remember seeing titles by The Women’s Press alongside Virago Modern Classics in the Silver Moon Bookshop in the early eighties. If I’d known then what I know now, if I hadn’t been a poor student, I’d have bought stacks of them. 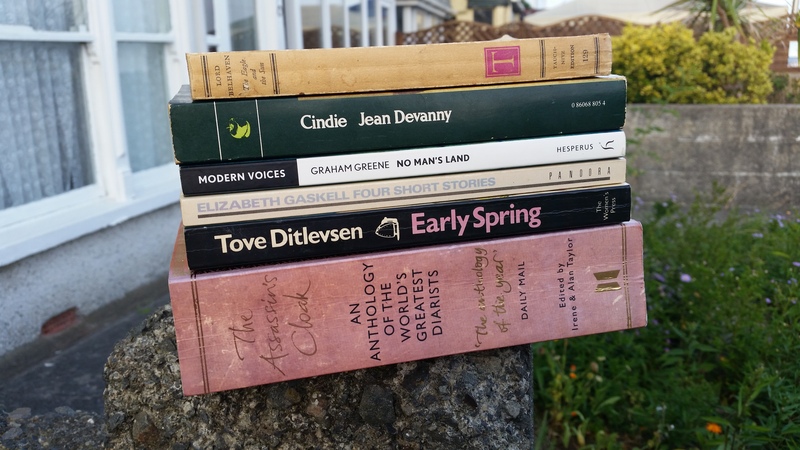 I’d never heard of Early Spring, or of Tove Ditlevsen, but, as the cover told me that the book was the story of the childhood of one of Denmark’s best loved writers, as I had faith in the publisher, I picked the book up. There’s what looks like a very good introduction too, but I want to save it for the right moment. I haven’t read Graham Greene for years and I thought that No Man’s Land – published by The Hesperus Press and containing two shorter works, published in between The Heart of the Matter and The End of the Affair (which I love) – might be a good place to start again. I have a copy of Cindie by Jean Devanny, but it was an Australian Virago Modern Classic and I’ve had a very good run of those, because I’ve had because it’s not one I see very often, I thought I should bring it home. I’m hoping to draw someone on this year’s Virago Secret Santa who doesn’t have a copy, but, if I draw someone who does, I know enough Virago lovers to be confident of finding this book a good new home. I love Tauchnitz Editions! I love that a German publisher published a wonderful range of novels in English over the course of a century, and so I always pick up their books when I spot them. 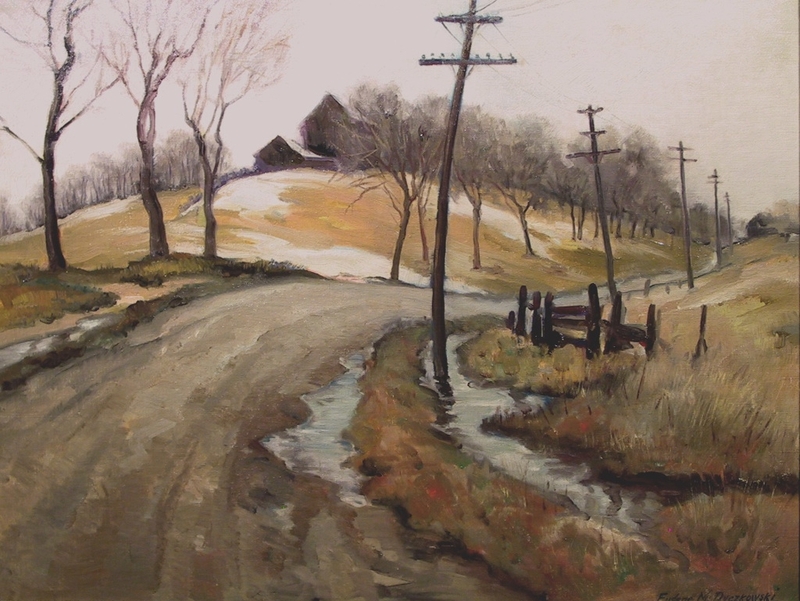 Margery Sharp …. my copy of ‘Four Gardens’ is a Tauchnitz Edition …. I know nothing about Lord Belhaven, I now nothing about The Eagle and The Sun, except that it is set in ancient Rome, and I’m not sure it will be my kind of book, but I had to give it a chance. I think my £2 was very well spent! 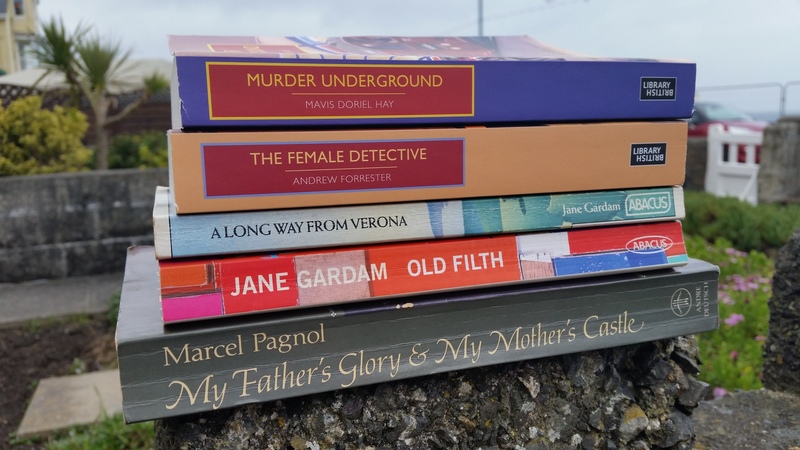 There has been bookshopping …. …. there often is, but it’s a long time since I’ve found so many interesting titles in the course of just a few days. On Saturday morning I spotted a ‘3 for £1’ sale at a charity shop in town. I’ve not had much luck with those sales lately, but of course I have to look, and this time my luck was in. Nancy Milford‘s biography of Zelda Fitzgerald has been on my wishlist for ages, and so I pounced as soon as I spotted. I was very taken with Sarah Moss‘s first novel – Cold Earth – and I’ve been wanting to read her second, and so when I spotted a copy of Night Waking I picked that up too. And then I needed a third. 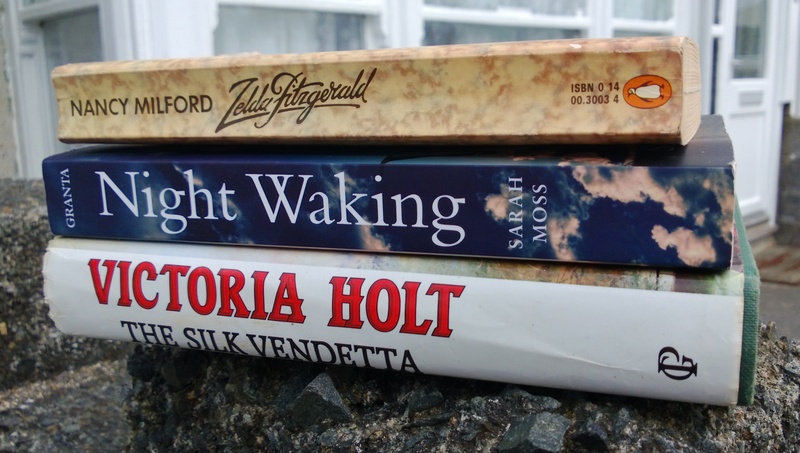 There was nothing unmissable but I spotted a book by Victoria Holt that I didn’t know – The Silk Vendetta – I liked the look of it and so it became my number three. There is a lovely café-bookshop a couple of hundred yards from my mother’s nursing home, and I hadn’t visited it in the nine months I’ve been visiting her. That was because I had Briar with me, but I haven’t taken her since my mother was ill, and became so much more frail than she had been. I would if she asked, but she hasn’t …. and that meant I could look in the bookshop. I found two lovely numbered Penguins. 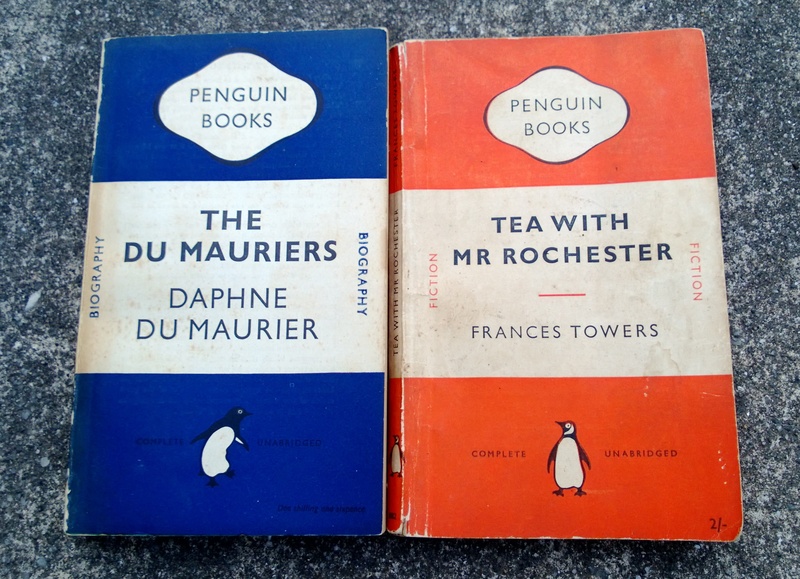 I have loved Daphne Du Maurier‘s writing from a very young age; I read every book the library could offer and, later on, I built a collection of my own, but I never came across a copy of The Du Mauriers before. I knew that it was a history of the family in the 19th century, but I hadn’t realised that it was written as a novel. I was smitten from the first page ….. Tea With Mr Rochester by Frances Towers is already in my Persephone collection, and it is a lovely collection of stories. But it holds ten stories – four less than the original edition. I don’t know why, I don’t know whose decision it was, but I remember finding out and being horribly disappointed that I had left a Penguin copy behind in the Oxfam shop a few years ago. I took a couple of extra days off work after Monday’s bank holiday – one for a jaunt and one to catch up with things around the house – and today was the day for the jaunt! We try to visit St Ives once a year, to look around the town, to visit the galleries, and to investigate some different bookshops. 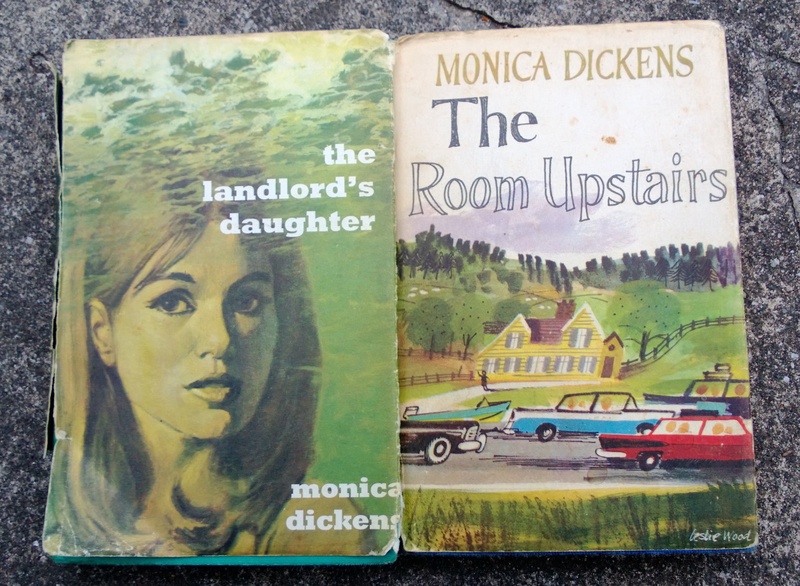 The Landlord’s Daughter and The Room Upstairs both date from the late sixties. The reviews seem to be very mixed, but I love Monica Dickens‘s writing and so, of course, I will give them the benefit of the doubt. The Oxfam Shop has been a happy hunting ground in the past, and it was again today. The Birds in the Trees by Nina Bawden fills a gap in my Virago Modern Classics collection. I loved her books for children – especially ‘Carrie’s War’ but I still haven’t read any of her adult novels. I really must. Judasland by Jennifer Dawson also comes dressed in Virago green, but it was published as a new novel in 1991, not as a modern classic. I’ve read one of her books – The Upstairs People – I love her style and I have a feeling that this comedy, set in academia, could be rather special. 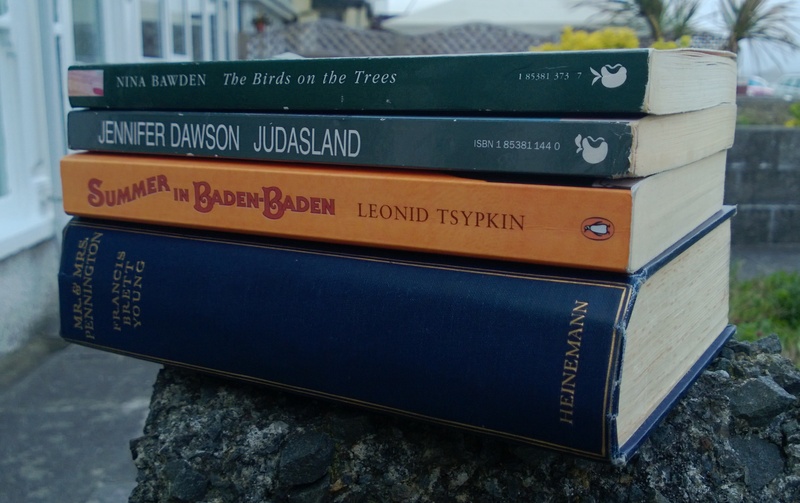 Summer in Baden-Baden is Leonard Tyspkin‘s homage to Dostoevsky and, because Russian novels are calling to me, because it’s a train book, I decided to pick it up. And, best of all, I found a book by Francis Brett Young. I love his writing, and I love that Mr and Mrs Pennington is the story of the first year of a marriage in the 1920s. Now I just need to magic up some more shelf space ….